A few weeks ago we tasted a nice set of California Syrahs and found good, well-made wines with very optimistic price tags on them. 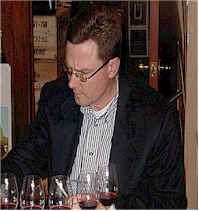 The group feeling, in general, was the wines were nice, but few had identifiable "Syrah" character. 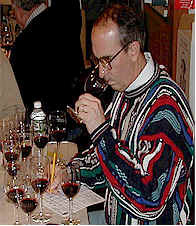 Further, we sensed that the winemakers were using their Merlot or Cabernet "recipes" on the wines. On this evening we assembled a set of eight Northern Rhne wines. 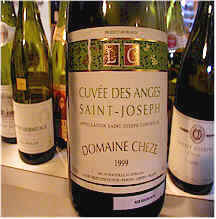 The two featured appellations were the rather affordable Saint-Joseph and Crozes-Hermitage. The 1999 vintage was rather early in the Rhne and producers in the northern areas (where tonight's wines came from) had clean fruit with few difficulties to contend with. This showed in the wine. This was one of the best tastings we've encountered in a while, virtually all the wines being good. What's more, many of them have reasonable price tags!!! 8th Place: JABOULET 1999 Crozes Hermitage "Domaine Raymond Roure"
The back label explains about this old property, recently purchased by Jaboulet, and talks about the richness and fullness of the wine. Most of the participants in our tasting wondered why the wine described on the back label was so different from the wine we encountered! One person did find this to be exceptional, describing it as the "most complex...big, thick, gritty and complex." Another participant described it as "tight and tannic," while someone likened it to some California Zinfandel wines, noting "it's quite jammy." Someone found "wet hay and cedar with jammy, earthy notes and 'bark'-like flavors...brambly and leafy in the mouth." Another person said it's "very superficial," while a final critic nailed it for being "flat and mushroomy." From an old vineyard that Guigal is now renting, the first person to offer an opinion found this to be "the most elegant of the tasting, with blackberry and cinnamon...well-knit, with loganberry and blackberry flavors." A second person described it as "grapefruit juice." 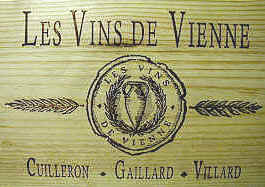 A third critic found it "well balanced, not a huge wine for cellaring...it might go five years." Yet another pegged it as "resinous on the nose and oaky on the palate." I found lots of raspberry jam fragrances, but not of the "cooked" nature. Very fresh and fruity with the same elements on the palate. Not a particularly profound wine...I was all for it until I saw the $30 price tag. One star (three star scale, zero being 'standard' or average in quality). Yes! The standard bottling of Saint-Joseph finished ahead of the more costly one! One person found it "light," while another detected a "canned corn aroma and simple, fruity, spicy notes...a bit light, but it is good." Another participant described this as "smoky, with crushed berry notes and high acidity and a short finish." Someone else found "mulberry and smoky notes with a slight touch of SO2. Another taster found it "light and pleasant, with some tobacco notes...not tons of fruit." I found a bit of berry and pepper spice notes in this youthful, fresh Syrah. The wine is moderately tannic with plenty of berry notes up front and spice notes on the finish. Five to eight years of cellaring potential. One-and-a-half stars. One critic questioned whether this was showing some "volatile acidity at first...cloudy, leathery with black pepper aromas and a chalky finish. It has ripe fruit notes and, yet, under-ripe fruit elements." A second taster described it as "concentrated but angular and it has a disagreeable note." A third fellow found "grapefruit and black olives." Someone else pegged it as "over extracted, quite ripe with a fair bit of oak, but it's coarse due to fruit tannins." I found this to be nicely wooded, with some hickory and berry aromas. Fairly full on the palate, it's juicy and berryish with moderate tannins, suggesting 3-8 years of cellaring. One-and-a-half stars. This wine met with many positive comments, the tasters surprised by its quality in relationship to its price tag. "Big, rich and coarse...a bit simple." said our lead-off batter. A second taster noted "it lacks complexity." Someone else found "sweet, dark berry notes and, while it's big and full, it's 'missing' something." Another found this "big and simple," while another person was "hoping for more character." Someone else found "the right amount of spice on both the bouquet and palate." The final commentator found "white pepper, coffee and a hint of blackberry cobbler." I described this as having a touch of berry-like aromas and other red fruits...the same features show up on the palate in a mildly-tannic, rather ready-to-drink Syrah. One-and-a-half stars. One lady found some "smoky and weedy notes, with an earthy quality and sweet carnation fragrances, followed by a yeasty, bizarre, almost beer-like note." A second participant felt this displayed "Brettanomyces, with coffee grounds and cinnamon notes." The third taster informed the group, "I hated it!" Another fellow found "canned corn on the nose and palate...it's very soft, so it's meant for immediate drinking." Someone else nailed it for being "sour, lemony with grapefruit and cooked characters." I was more positive about this, finding a berry and floral note, along with some sweet spices. A hint of bacon added complexity to the fragrance. I found more power here and a bit of tannin, suggesting several years of cellaring are warranted. Two stars. "Herbal, with a spicy, oaky veneer...good depth and flavors...complete and energetic." were the words of the first critic. 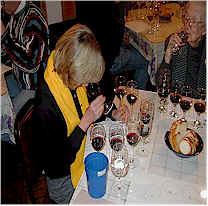 A second "regular" participant said "It's the best wine of the last three tastings!" Someone else found "violets and toasty oak...lengthy." One critic nailed it for being "flabby and lacking structure," while someone else found it "astringent and not flabby, but closed." Others mumbled something about "tart" and a "citrusy aftertaste." I described this as "oaky, woodsy, reminding me of the Qup Hillside Select in our previous tasting. It may have a bit more fruit than the California wine, with some leathery and meaty notes. Those features were not met with enthusiasm from Ellen, who routinely deducts points for those characteristics. The flavors show hickory, smoky, bacony notes and the wine has enough tannin to go another 5-12 years, in my humble opinion. Hard to resist drinking it now, though. Two stars, plus! Few people spoke up in describing this wine, having little to add to the first folks to offer an opinion. "Nicely integrated oak, spicy, peppery, rich and complete." A second added "It's the best made and best balanced." Someone else found "rich, black coffee notes with some cream." A fourth person didn't find it "excessively oaky, but you do notice the wood." I found lots of fresh oak and woodsy notes, along with plenty of berries and black fruits. On the palate I detected rich cocoa and berry elements with some wood. Very complete. Five to fifteen years of cellaring. Two-and-a-half stars.